During the breeding season we have observed how the chicks of different species have been growing. Now our attention needs to be focused on the adults. Many of them invest considerable behavioural effort in reproduction. This process always requires consumption of vital resources. This is the reason why we must provide them with the necessary conditions in order to get them re-established and with maximum vigour for a new breeding period. For this we offer them tranquillity and arrange the best conditions for a good moult and a balanced diet in order to prevent gaining too much weight. In order to be prepared for the winter season, we increase the fat content of the parrots that after a recent breeding are receiving now the winter season. We must ensure that they are digesting well the food in order not to get weak and still stay in shape. 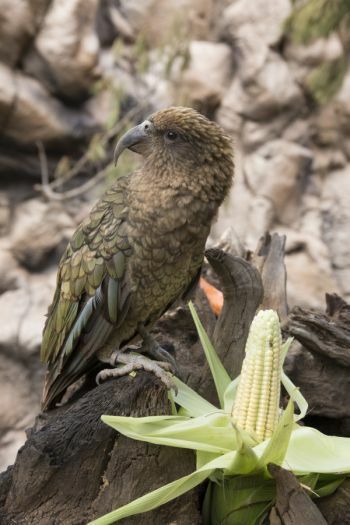 The parrot nutrition varies throughout the year. Our aim is to cover the different animal needs, which differs from season to season. Even a full but monotonous diet could be not enough to keep them healthy. 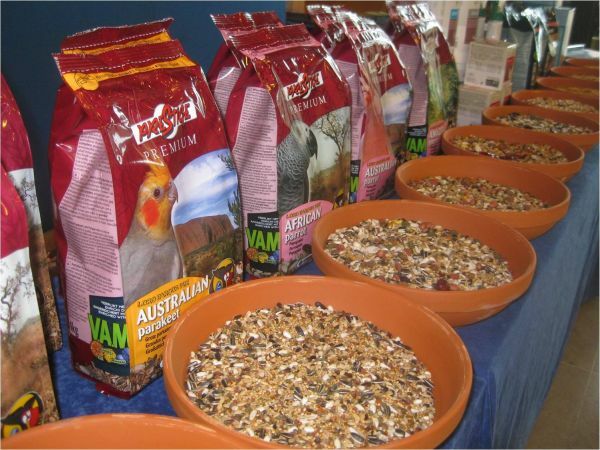 Many breeders wonder why their parrots only choose certain seeds of the mixture that we offer them. They also wonder why they despise during some months certain fruits, and why the same fruits become their favourite ones during other months. This depends on their appetite that differs seasonally. We offer them variety in order to meet all necessary nutritional elements. In winter time, most of the parrots reject green food such as lettuce. However they love the seasonal herbs during this time. The herbs contain chemical elements that benefit/improve their metabolism. The small species also reject fruit if temperatures are low. During this time they need less hydration and are more likely to eat seeds. Breeders should be careful that they do not eat too much of them. We only give them oily seeds since during this season they will tend to fatten and this can have a negative effect on fertility. However, in winter the parrots have to put on fat in order to be able to meet the low temperatures if they living in an outdoor aviary. The winter diet consists in vitamins and nutrients that are easy to absorb. Their immune system must be strengthened to face/confront the cold winter time. 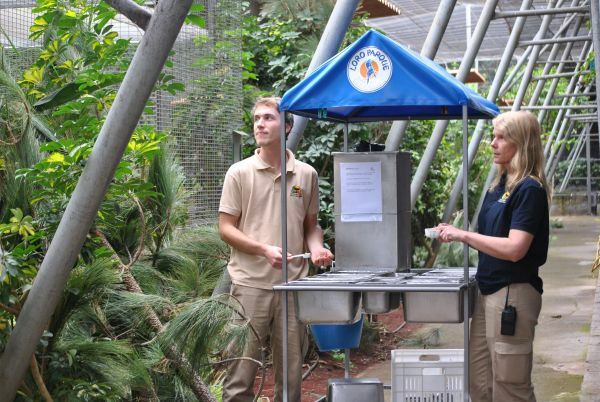 In case of indoor aviaries, the criteria are different, but even keeping the parrots indoor, it is good for the species to experience a drop in temperatures and lower daylight hours in order to respond well during the breeding season. Most of the species respond well to tropical and subtropical climate. Therefore, the managing of species living in breeding centres located in a humid zone above 60% relative humidity, with a mild average temperature, is not so complicate. If case of low temperatures and dry climate, we need to work with parameters that must be monitored constantly. If humidity increases too much combined with cold temperature, it can weaken the animals. It is the breeder’s responsibility to adapt the precise setting for each place. Dry climate and moderate temperatures are more easily to control. We can increase the temperature to a comfortable minimum for the species that won´t affect their health. Mixture of balanced seeds according to the needs of each species group. In case of hot atmosphere, as exceeding 25ºC, the high humidity can cause great inconveniences, especially in the provided food. The sum of these two factors can lead to the growth of fungi and bacteria. Good ventilation is also important, as well as to renew regularly the food. If not, some species can develop pathologies that will be difficult to detect from the first moment. It will be especially for the dry climate native Australian granivorous species more difficult to thrive. Seeds, egg food and already prepared food will keep longer hours in good condition in dry environments. It will be the opposite in the presence of high humidity, where the renewal of the troughs should be made more frequent to avoid unwanted changes that deteriorate the food and reduce its quality. In the European latitudes the Amazons coexist very well with low temperatures. The intake of oily food increases in order to obtain the calories that allow them to meet the necessary energy resources to achieve good thermoregulation. The caregivers must pay special attention at this time to the diet because if the breeding birds fatten too much, they will have problems during the breeding, they probably not even make any attempt. It is at the end of summer and during autumn when the birds must obtain these oily resources that they will be able to metabolize when low temperatures and shorter days arrive. Our aim is to keep the birds in shape in order to allow males and females of adequate age to synchronize avoiding aggression. We could observe that specially white and pink cockatoos living in outdoor aviaries in the north of Europe, where temperatures drop considerably, do not gain weight because their body digests the food faster. Although the species living in warmer climates have an amazing predisposition to develop an important layer of fat that, in the long term, hinders a healthy life. 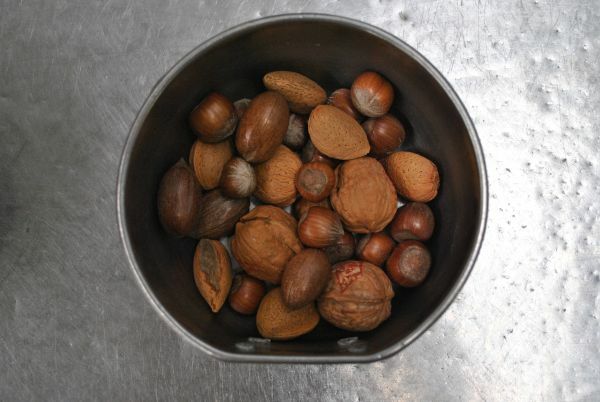 This is the reason why breeder reduce the supply of food such nuts or sunflower seeds as much as possible. Zoos must turn its attention to the different needs of each species in order to adjust the kilocalories of each one. We take into account the differences between the parrots that we learn from experience and observing the animals. In order to maintain a reserve, with such a high and diverse number of species, as Loro Parque Fundación does, our caregivers must follow constantly and strictly the protocols. Thanks to adjust the specific energy requirements of each species group and the collaboration with the animal food firm Versele-Laga, we have achieved safe food bases, which also allow us to modify the diet, if necessary. This means a great benefit for us, since the varied, clean and nutritious food allow parrots to achieve their maximum splendor. Evidence of it is the well-formed and brightness feathers that indicate strength and vigor needed to advance in the different stages of their life.